Three members of The Cockcroft Institute, Prof Graeme Burt (Lancaster University), Prof Peter McIntosh (ASTeC/STFC) and Dr Deepa Angal-Kalinin (ASTeC/STFC) recently attended a workshop organised by the International Cancer Expert Corps (ICEC), CERN and STFC to address the global shortage of radiotherapy facilities in low-middle income countries. Deepa Angal-Kalinin discussing radiotherapy in Botswana’s radiotherapy centre. The workshop was held in Gaborone, Botswana from the 20th to 22nd March and attended by 60 participants including oncologists, medical physicists and accelerator experts from 7 African countries, Nepal, ICEC, CERN and UK institutes. The workshop goal was to facilitate discussions around the technical challenges that need to be overcome for the development of rational and affordable radiotherapy cancer treatment technology for deployment in challenging environments. Cockcroft members from STFC-ASTeC, Lancaster and Strathclyde are part of an STFC funded Global Challenge Research Funded (GCRF) program to help develop linac solutions to make radiotherapy cheaper, more robust & more maintainable, focussing on the electron source and the RF systems. 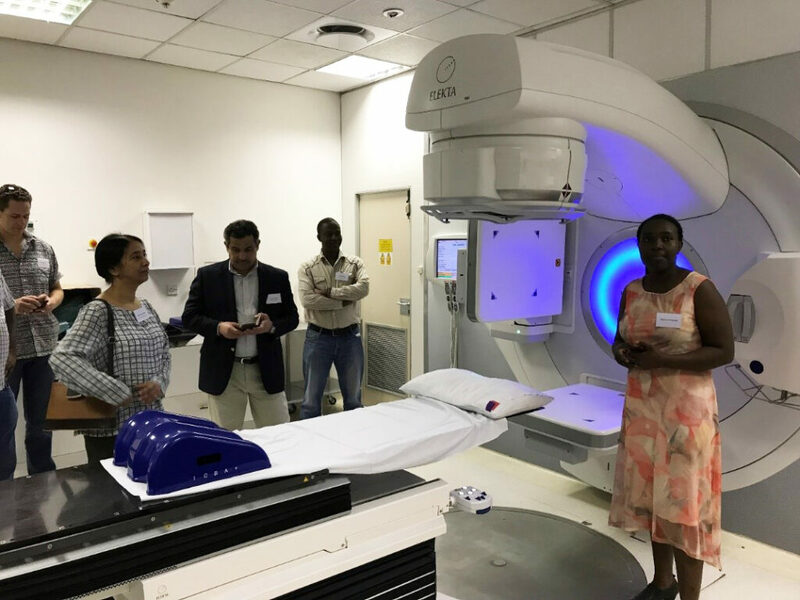 As part of the ICEC-CERN-STFC workshop, the participants were able to visit three hospitals in Botswana to experience first-hand the challenge of being able to effectively deliver radiotherapy in Africa. In the lowest income counties within Africa only 4% of cancer patients that require radiotherapy are actually able to receive it. About 80% of the available machines are found in just six countries: South Africa, Egypt,Morocco,Tunisia, Nigeria and Algeria. The annual global incidence of cancer is projected to rise by 2035 to 25 million cases (13 million deaths) with 65 – 70% occurring in Low and Middle Income Countries (LMICs).